The weather has been getting hotter, which is both great and terrible. Great for all the pool parties, hiking trips and outdoor events, but terrible for your makeup. It’s awful when 5 o’clock rolls around and you notice that all of your makeup has melted off your face due to the heat. No need to have a real meltdown, I’ve rounded up a few of my favorite setting sprays that are perfect for keeping your makeup in check all day and all night. Kat Von D Lock N’ Load Setting Mist – As a tatoo artist, Kat Von D knows how to make something that lasts. If you’ve ever tried her tattoo foundation, you definitely know what I mean. That stuff does NOT come off unless you want it too. If you’re looking for something that has heavy duty staying power, definitely pick up a bottle of this. Make Up For Ever Mist & Fix Spray – If you’re looking for something that is a little lighter with some in-house hydration, pick up this Make Up For Ever mist. It’s not at sticky like some mists and definitely gives you a nice little glow. 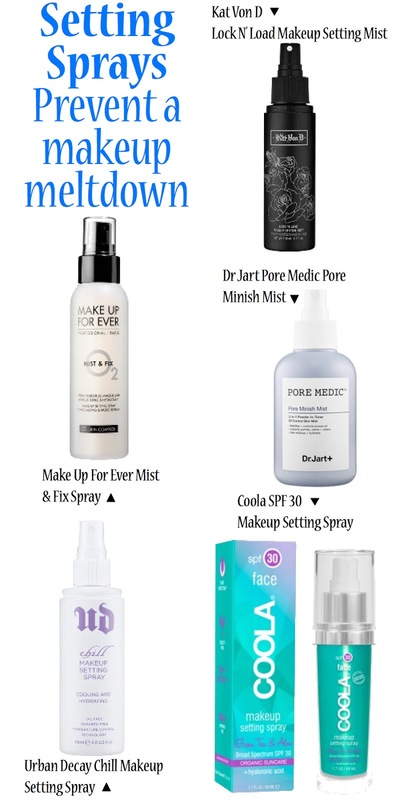 Dr. Jart Pore Medic Pore Finish Mist – If you’re someone who gets super oily, then this is your mist. It’s great for reducing the shine that shows up on your face after a long day. Urban Decay Chill Makeup Setting Spray – This spray is my go to during the winter months. I think it’s just as helpful in the summer, but it’s really perfect for anyone who has dry skin year round. With temperature control technology, it actually cools your face to prevent your makeup from sliding around or settling into lines. It also gives you a great dose of moisture so your skin doesn’t dry out. Coola SPF 30 Makeup Setting Spray – My new setting spray favorite! I’ve always loved Coola’s products so I was so excited when I heard they came out with their own makeup setting mist. It eve has SPF in it, which those of us with pale skin definitely need. I spray it on in the morning right after I finish my makeup and I noticed that I didn’t need to reach for my compact the entire day. No shine, no problem! Its under 3oz too so it’s great for travel! I’m definitely using this for all my summer days spent in the sun. Love your makeup spray reviews!! I have tried Loreal's, which is great for after applying makeup which great for drugstore/mass retail setting spray! I love Smashbox spray because you can spray before/after which is refreshing during summer heat and its not heavy product! I can't wait to try Coola via Birchbox!! I like MAC's fix+ too. I've sampled Coola and I like it so far!